Dexter Russell Outdoors now provides the latest in handle technology....personalized handles! 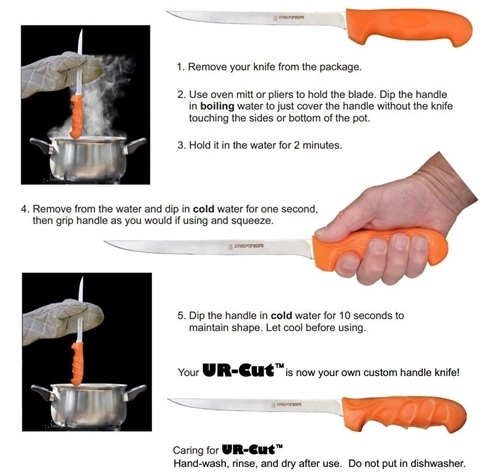 Moldable handle material allows the user to form each handle to their particular grip, making the handle more comfortable to use and easier to grip. Custom formed to Your Hand to enhance control and precision of the cut. Dexter Russell has taken filleting to the next level - order yours now and show your friends. They will have to order their own, because your grip is not their grip. 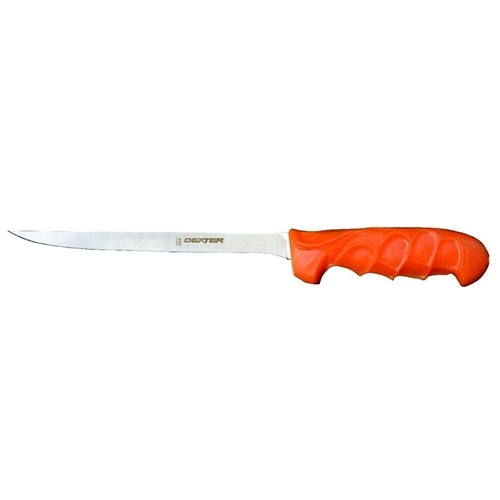 Fillet knives are designed to be thin and flexible giving you great control and precision. Often used with fish, these knives are capable of lying between the skin and top layer of meat to provide a nice clean cut. Their blades have engineered flex points that spring back to its shape. They will glide right through the meat and hold a very sharp edge, hardly needing to be re-sharpened. When the knives need to be re-sharpened they will sharpen to the same sharpness as they were before thanks to the DEXSTEEL they were created with. Fillet and boning knives have similar uses except that a fillet knife is much longer and thinner allowing for easier work when dealing with fine and thin cuts.